I’ve been using Caboodles products since I was a teenager. We won’t go into the details of exactly how long ago that was because I know your time is precious. 😉 But I will tell you that I still, to this day, use and adore products from the Caboodles line. I currently use their Sassy Bag for my everyday makeup. It stores quite nicely under my bathroom sink. When it’s time to travel to all I have to do is put the Sassy bag in my suitcase and I’m good to go packing my makeup essentials. My daughter uses the Zebra Train Case and she loves to store her everyday makeup items in it as well, but it’s also pretty enough she doesn’t mind keeping it out on her dresser. The Sassy case is pictured to the left. 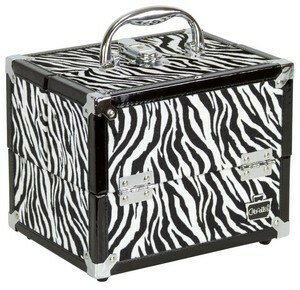 Here’s the Zebra Train Case. We both use these every single day and it just works! 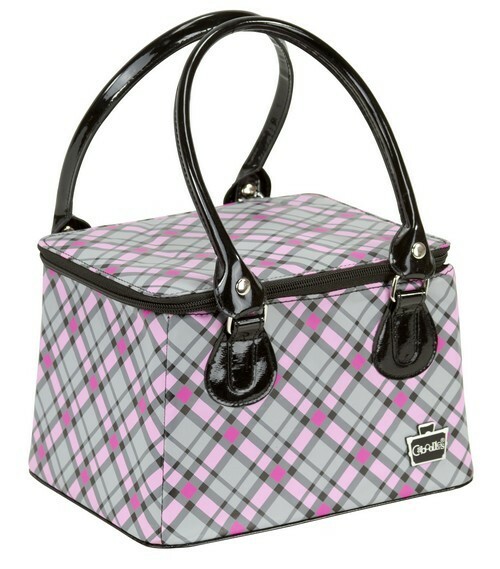 Caboodles has added two new products to their spring line and they have both caught my attention. I’m a nail polish girl. My nails are always painted. If they’re not, that usually means I’m sick, or dead. As of now, my polish is stored in a wicker basket type thing and well, it’s not working. It’s quite frankly annoying! So when I heard Caboodles came out with a new product called the Gilded Pleasure Nail Valet, I was all ears! The Gilded Pleasure Nail Valet Caboodle is the ultimate companion for any nail polish lover who wants to organize their ever-growing polish collection. In keeping with this spring’s hottest trends, the new Nail Valet comes in black-and-white zebra print with a hot pink zippered top for an added pop of color. A mirrored lid and five elastic top pockets in the lid keep manicure supplies separated and secure. The horizontally divided, removable, 2.5″ deep tray is perfect for housing polish remover, cuticle oil, hand cream and any other mani-pedi must-haves. In the base is a removable 24-compartment grid divider where 24 pretty nail polishes nest neatly in four rows of six. PERFECT. Exactly what I need. The second product they are introducing this spring is the Envy Bag. Since I’m already a fan of their ‘It’ bags, I knew I would love this one. The looks is super classy. This is something I would gladly carry on the airplane, to the gym or just out and about. The Envy ‘It’ Bag helps beauty lovers go from work to play and back again. The chic carrier is a tote that does double duty as a makeup organizer. 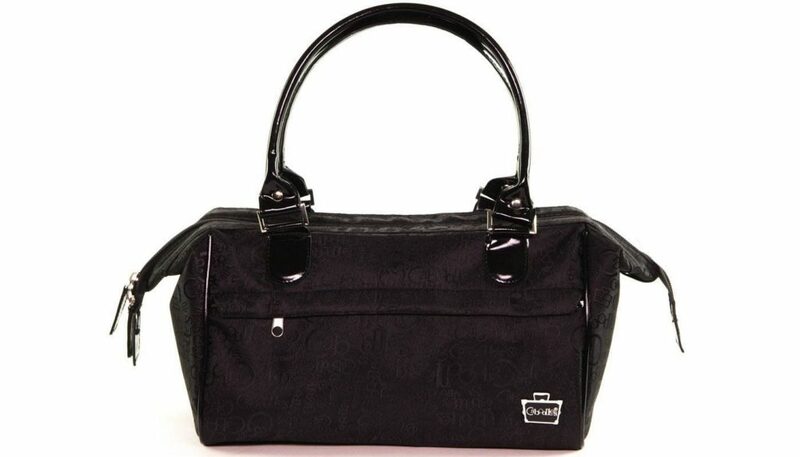 Outfitted in sleek black fabric with white polka dots, it opens to reveal a spacious interior with smartly placed inner pockets and elastic band storage to keep products and brushes in place. Keys, iPhone, lipstick – there is room for all the necessities. What do you think about Caboodles new spring products? I think it’s time to do some spring cleaning when it comes to your makeup and one of the best ways to get started is by purchasing a makeup organizer you love to look at, hold and use. Previous article5 Easy Ways to Go from a Desk Outfit to a Date Night Outfit in a Snap! Can you tell me where I can buy one of these online? The caboodles nail valet. I checked Walmart, but didn’t find it there. You’re about the 5th person that has ask me this. People want this nail valet!! 🙂 I’ve sent in a request asking for where to purchase. I’ll let you know as soon as I find out. The Zebra print one I showed in this post is not available online right now. Hope that helps! I haven’t been able to track down the black and white polka dot one, only the solid black one at Walgreens.com and Drugstore.com. They seem to not stay in stock very long!